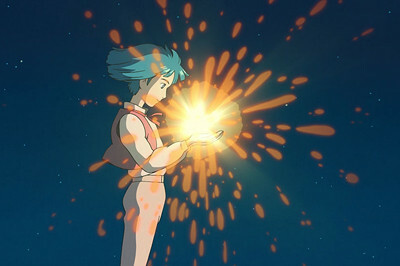 Hayao Miyazaki created his first truly original piece of animation in the mid-‘80s with the steampunk-esque fantasy Nausicaa of the Valley of the Wind, an adaptation of his own manga book series, marking the first collaborative project to come out of what would transform into the now iconic Studio Ghibli. 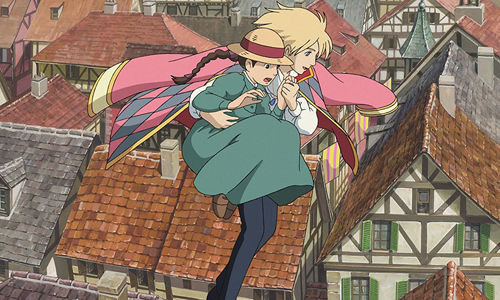 Twenty years of world-building and characterization followed before the release of Howl's Moving Castle, a broad-scoped tale of wizards and warfare given intimacy by a curse placed on a common hat maker. 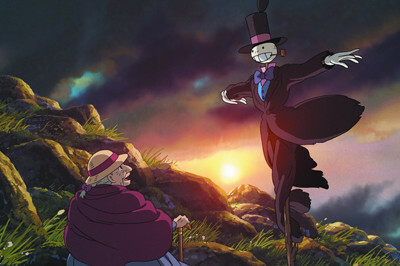 Creativity runs rampant throughout all of Miyazaki's works, usually offering visual and emotional delights unlike those that people have seen before, even those familiar with their body of work. 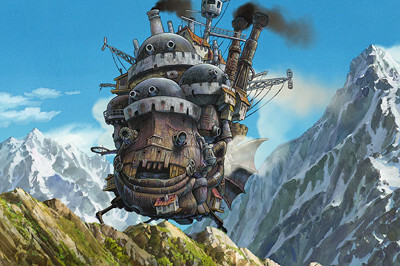 Howl's Moving Castle marches to the beat of a different drummer: whether intentional or not, the designs of locations, machines, and surreal transformations overly mimic those in previous works from Miyazaki, resulting in gorgeous, vibrant, yet relatively uninventive journey through familiar sights and sounds. Going into a little more detail about those, the 1.85:1-framed, 1080p AVC transfer is simply staggering, predictable or not based off the film's age. Brush strokes and all the black lines are delicate and nuanced, while ornate details in clothing, food, and décor are delicate and sharp. Colors are bold yet mindful of the artwork's desired shading, while the contrast levels yield shadowy corners and darkened landscape that are both deep yet constantly aware of all details within. No issues with compression or digital presence, and the cinematic flow of the artwork is impeccable. Both the English and Japanese language tracks are presented in 5.1 DTS-HD Master Audio treatments that contain the same convincing, hearty representations of warfare and steampunk-infused machinery one could expect, sporting tight bass response with rattling engines and explosions of all kinds. They also project delightfully nuanced little details: the crackling of a fire and sizzle of cooking food, the clinks of machinery and huffs of steam, the click of the magic door's color swatch and the creak of door hinges. A feast for the eyes and ears. 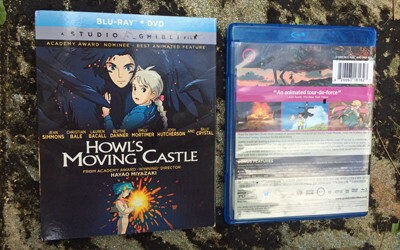 Those who want a slightly more comprehensive slate of extras will want to take a look at the GKIDS release of Howl's Moving Castle, though, as it includes a few bonus materials that weren't available the first time around in the US but have been available in other regions. 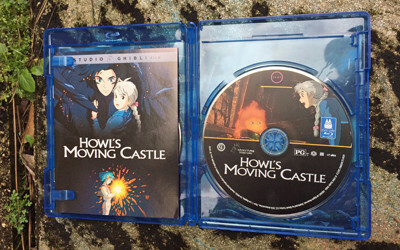 The bits-‘n-pieces found on Disney's Blu-ray have mostly been carried over onto the GKIDS release, which are: Feature-Length Storyboards (1:59:13, 16x9 HD); Behind the Microphone (9:02, 4x3); and Miyazaki's Visit to Pixar (16:29, 4x3). They've also included a comprehensive collection of Original Theatrical Trailers (8:17, 16x9 HD) and TV Spots (8:24, 4x and TV Spots (8:24, 4x3). You'll notice that the Interview with Pete Doctor is missing.